I have many interests…probably too many. I am going to do more fairy gardens, but I am at that blocked stage and thought I’d share some other helpful information with you while waiting for the block to lift. I would like to share a wide variety of things with you as time goes on. A long time ago, I decided that I wanted to learn about natural healing and aromatherapy. I enrolled in a class in my area. I wanted to learn how to use the essential oils to help myself and my family. I completed the course and have been using the oils successfully ever since. I love using essential oils because they are so versatile. It is amazing that few drops of essential oil can aid in healing. I want to share one of those times with you. I have really bad allergies that cause asthma. Sometimes I need a little more help with breathing clearly. I cannot use the inhalers that most asthmatics use. I use a Himalayan Salt inhaler and some allergy meds most days, but some days it gets worse and I need added help. I thought I’d try something. I had been on Amazon and saw some essential oil inhaler tubes. That looked like an idea I had to try. It really works! The order I placed was for a set of three inhalers, a lavender, a green, and a blue. There is a little glass bottle inside the inhalers. You put a wick, which is included and more can be ordered, into the bottle and drop some essential oil onto the wick. There is a small metal cap with holes in it that fits over the top of the bottle. All you have to do is pop the cap off and start inhaling. The best essential oils to use for asthma and respiratory issues are Eucalyptus and Lavender. Eucalyptus is well known for helping with respiratory issues and Lavender is calming, and soothing, which helps you to relax. I chose the blue and pink inhalers for this project. I put the Eucalyptus into the blue one and Lavender into the pink one. I used about 15 drops in each, using an eyedropper. When I am really congested or having a bad allergy day, I keep those two inhalers with me. Just pop the caps off and inhale slowly. For me, it only takes a short time for them to start working. It calms things right down. I really get help from them when using my stationary bike. The exercise increases my asthma symptoms, making it hard to finish the exercise session. Everyone is different and react to things differently, so don’t compare person-to-person. If you are currently taking medications, don’t stop. This is not a substitute for medications. It just assists at times to give you an extra boost of help. I hope it works well for you. I wanted to use the green inhaler as well, so I put Peppermint oil in that one. Peppermint is good for when you are feeling sluggish and need a pep-me-up. Peppermint oil is energizing! There are many essential oil inhalers available online. I don’t get any kickback for my recommendations. I will only show you what I use. https://www.amazon.com/Essential-Refillable-Removable-Rivertree-Life/dp/B00O99DNS4/ref=sr_1_6_a_it?ie=UTF8&qid=1480539892&sr=8-6&keywords=essential+oil+inhalers There are also a bunch of essential oil companies out there. I use several companies. I used NOW for the inhalers. Always make sure that the essential oils that you use are 100% pure. Be careful, many essential oils can burn the skin when used without diluting in a carrier oil. For the inhalers, there is no need to dilute the oil. I have some new photos to add for our wildlife habitat. I thought I would share them with you. I am enjoying them since I wasn’t able to do much gardening this year. I hope you enjoy them too. Some of the pictures might be very similar to ones I posted from last Summer. Many of these flowers and plants come back every year. They reseed and grow as they want. We let them stay where they choose. It makes it a very natural looking environment. I am sorry if I keep revising this post, but I am still learning what WordPress can do. I will post more photos as I am able. Hope you enjoyed them so far. It really is a magical place. It is so serene. It is truly a place to relax and unwind. I am sorry if I keep revising this. I am still learning how to work with WordPress. I have had some requests for the names of the plants that I used in the fairy garden barrels. I finally found the plant tags. I might not have all of them, but I have most of them. Some of the photos aren’t as clear and sharp as I would like them, but the conditions were not ideal for the photo taking. White Baby’s Breath (Gypsophila “White Festival”)– A mounding perennial…I had this plant in the second fairy garden toward the back. Creeping Thyme (Thymus serpyllum) – A perennial…I had this in front of the fairy house in the first fairy garden and around the general store in the second fairy garden. It makes a beautiful carpet of ground cover with tiny purple flowers. Miniature Rush (Eleocharis radicans) – A perennial…These were in the third garden around the lake. They look like clumps of grass. They do require quite a bit of water. They did not come back this year. We had a rather dry winter. Potentilla (Cinguefoil “Verna Nana”) – A perennial…this is a low-growing evergreen with lots of yellow flowers. It looks just like the full sized plant that a lot of us have in our landscaping. I had this plant behind the fairy house in the garden of the first fairy garden. Mini Needlepoint Ivy (Hedera) – this is an evergreen plant. I had it planted right behind the house in the first fairy garden. I was hoping to train it to grow up the house and over the porch. I am not seeing this year. The winter must have gotten it. Thrift (Armeria maritima ‘Alba’ white) – This is also known as Sea Pink. The plant is a mound of grass-like green leaves with tiny white flowers. This plant was also in the first barrel behind the house in the fairy garden’s garden area. Hummingbird Trumpet (Zauschineria garettii ‘Orange Carpet’) – This plant looks just like a miniature version of a Trumpet Vine and is a perrenial. 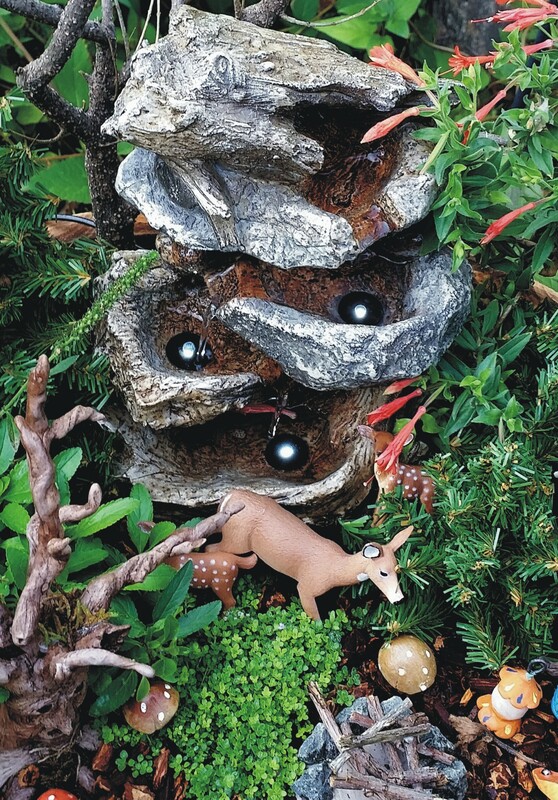 I had that in the fourth fairy garden to the right of the rocky waterfall. Stonecrop (Sedum hispanicum minus ‘Blue Carpet’) – This plant nakes a great ground cover. It spreads quickly. This is a succulent with silver-gray foliage and tiny pale pink flowers. I had it planted to the left of the fairy house in the first fairy garden. Speedwell (Veronica liwanensis) – This is another low-growing ground cover. Bright flowers appear on the leathery leaves. I had one of these in the first garden and in the third. It is very drought tolerant. Sandia Coral Bells (Heuchera pulchella) – An evergreen with ruffled green leaves and spikes of tiny rose-pink bells. This was also in the garden behind the fair house in the first fairy garden. 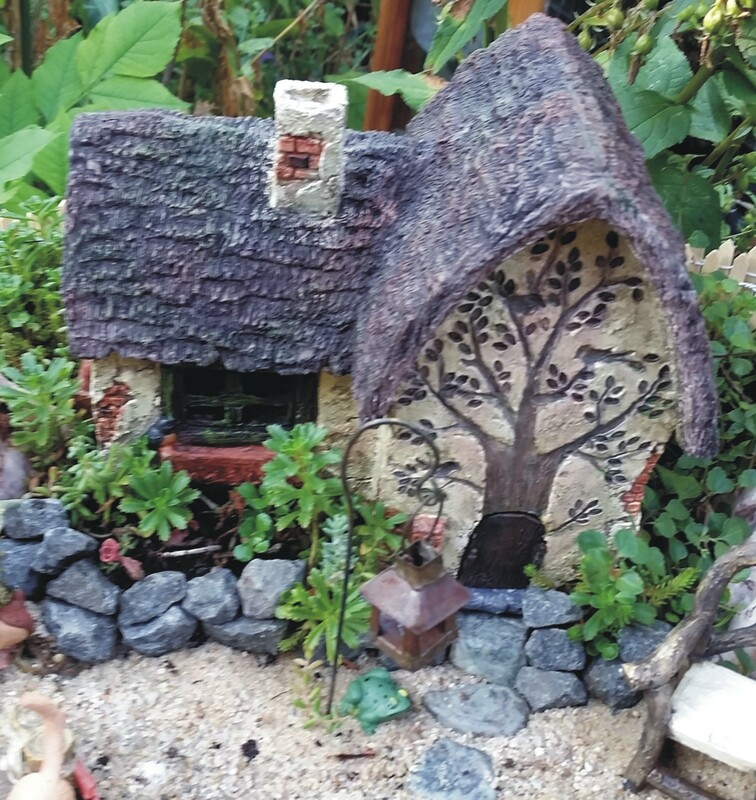 There was also one on the side of the second fairy garden house. Dalmation Pink Cranesbill (Geranium dalmaticum) – A low-growing geranium with glossy green leaves with pink flowers. I think there was one of these in the garden of the first fairy garden and also one in the third garden on the side of the house. Bellflower (Campanula cochleariifolia ‘Alpine Breeze Blue’) – lots of blue flowers that cover the plant. This is very pretty. I think there was one of these in the first garden in the back and also one in the third garden on the side of the cottage. Leptinella (‘Platt’s Black’) – an evergreen ground cover with feathery, fern-like, foliage. I am very fond of this plant, but it didn’t make it through the winter. I had these in the first and second garden next to the covered bridge. I hope this helps. The balance of the four gardens were filled with a mix of ground cover. It came in flats from Lowe’s. That is really an economical way to fill the barrels with plants. The fir trees are actually fake miniature Christmas trees from the hobby store. If I remembered the plants in the wrong places, I apologize. The ground covers have really grown a lot and I never got my gardens put back together this year because of my foot and ankle injuries. I miss the gardens, but am enjoying the plants that survived. I will be putting the gardens up next spring for sure. Let me know if you have any questions and happy fairy gardening! 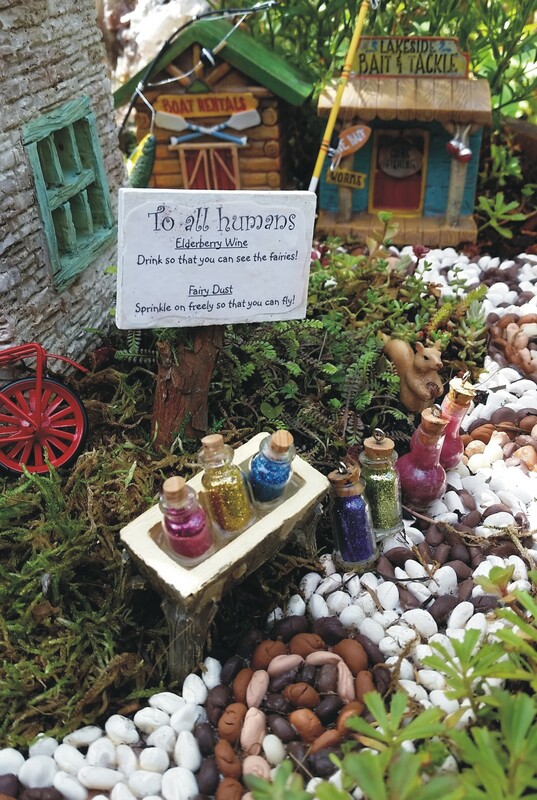 Okay…I know some of you have been waiting for a tutorial on how to make the enchanted trees for the fairy gardens. I apologize that it has taken so long, but have been out of commission for about six months, nursing two sprained feet and ankles back to health…ouch! Don’t ever sprain your feet and ankles…you can’t do anything!!!! 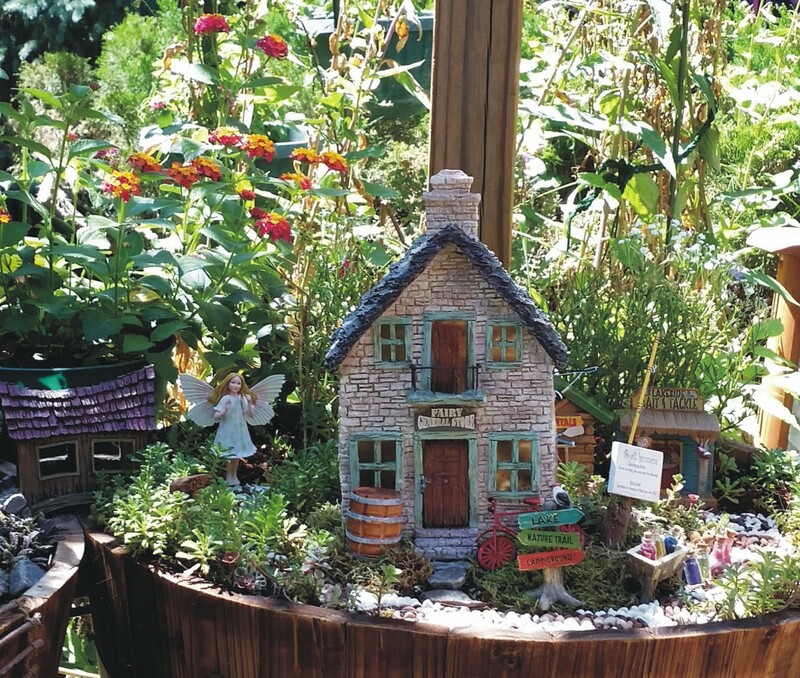 Here it is the middle of July and I don’t even have all of my fairy gardens out. Guess it will have to wait until next Spring. That is something to look forward to. In the mean time I will work on items for the fairy gardens. I am kind of new to this tutorial writing, so please ask questions if you have them. These trees are quite easy to make. The main thing is to not try to make it too perfect. There is no such thing as a perfect tree…especially enchanted ones. So give the tree a personality all of its own. Cut 8-12 lengths of copper wire. Allow enough length for roots, trunk, and branches in each cut. 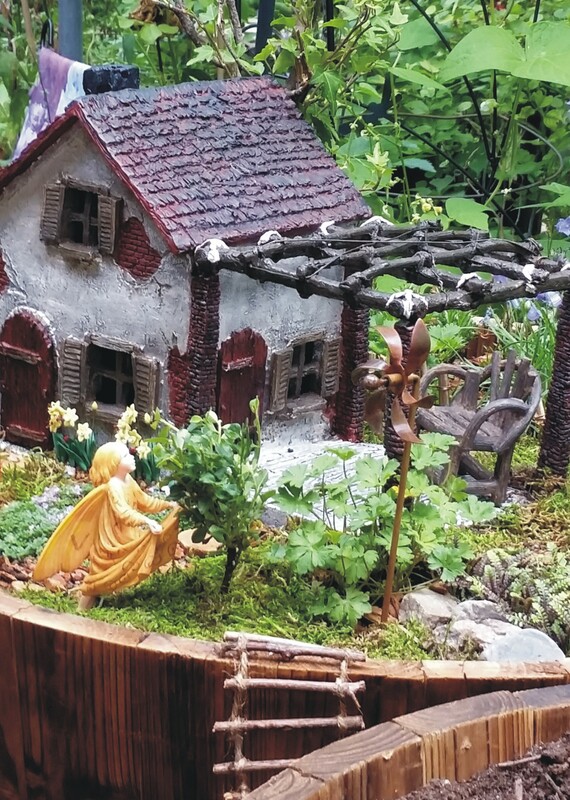 The two trees in this fairy garden have trunks about 4-5″, but allow a tiny bit more because you will twist the wires together and that will shorten the length. I buy copper wire by the spool because I also make jewelry. I get it at The Naja, my jewelry making supply store. I am sure there are many other places that carry it by the spool too. If you are only going to make one or two trees you might not want to go that way. You can also buy it in smaller quantities. Twist all of the wires together in the middle to form a trunk. Bend the roots out and the branches. I sometimes loop the ends of the wires to prevent getting scratched while working on the tree. Take aluminum foil and wrap around the wire trunk. You really don’t need to wrap foil around the branches or roots…just the trunk. Keep wrapping until it is as thick as you want it…remember that the clay will also add some width to the trunk. Scrunch it together. Don’t worry about making it smooth or even…tree trunks are usually bumpy and lumpy. Now take the branches and fan them out and do the same with the roots. You don’t have to have them perfect. You can move them around a bit later. I like to fan out the roots and see how it sits on a table. If the branches or roots seem too long, you can trim them now. Make the branches and roots all wavy and irregular. Tree branches and roots are not all the same length or width. We will add smaller branches using the clay, so these are just the main branches. The roots just need to be long enough to keep the tree from falling over. They can be off the ground in spots too. Take your clay and after working it in your hands to soften, start spreading it all over the foil, covering it at least 1/8 to 1/4 inch thick. Cover the trunk and then start adding clay to the wire roots and branches. Remember that both are thicker by the trunk and then get thinner. You can make lumps and bumps on the branches and roots. You can also add some tiny side branches off of the wired branches by just using some clay. Sometimes I put small holes in the lumps to look like knots in the trees. You can also make hollowed out looking broken branches by adding clay in between branches not using wires. After you get all of the branches, roots, and trunk covered, check for spots that didn’t get covered. Also make sure the tree stands properly without falling over. Now take your toothpick or sculpting tools and start etching lines in the clay. Make some swirly and irregular. Make sure to engrave lines on the branches and roots too. If you are adding glass eyes, now is the time to add them. I usually etch into the clay where I want them. I then gently press the eyes into the clay. Keep working with them until they look the way you want them to. The clay won’t harden if you keep working on it. If you make a mistake you can pull the clay off and fix it. Give the tree some personality. You can add a nose and mouth too. There is no wrong way of doing these trees. When you are completely happy with the tree, it is time to bake it. If using a toaster oven, I cover the tray with foil and then lay the tree down so that it will fit. Please be sure to open doors and windows. The clay gives off fumes when baking. Bake according to the clay package instructions. Let the tree cool completely after baking. If you want to accent the lines in the bark of the tree after baking and cooling, you can use some dark brown acrylic paint. Paint it all over the tree and then gently wipe off the surface, leaving the lines dark. I like to glue some dry moss here and there onto the branches and roots. I use Gorilla Glue for Wood because it holds up outdoors and it seems to work fine with polymer clay. Blue Heron Statue. Looks quite real from a distance. We had to get this statue because a real Blue Heron came and ate our Bullfrogs. A place to sit and contemplate and enjoy the wildlife. We have park benches all through the back yard for this purpose. Wicker Rocker on Deck…great way to relax! Purple Wild Flowers – not sure where they came from, but they come back every year and spread. Can You Find the Bull Frog? Snack Box…was old, plain, and falling apart. I painted it, made fake doors, put shingles on roof…now it is beautiful. The raccoons like to take the roof off to see what is in there. We were all excited when we got our habitat signs. 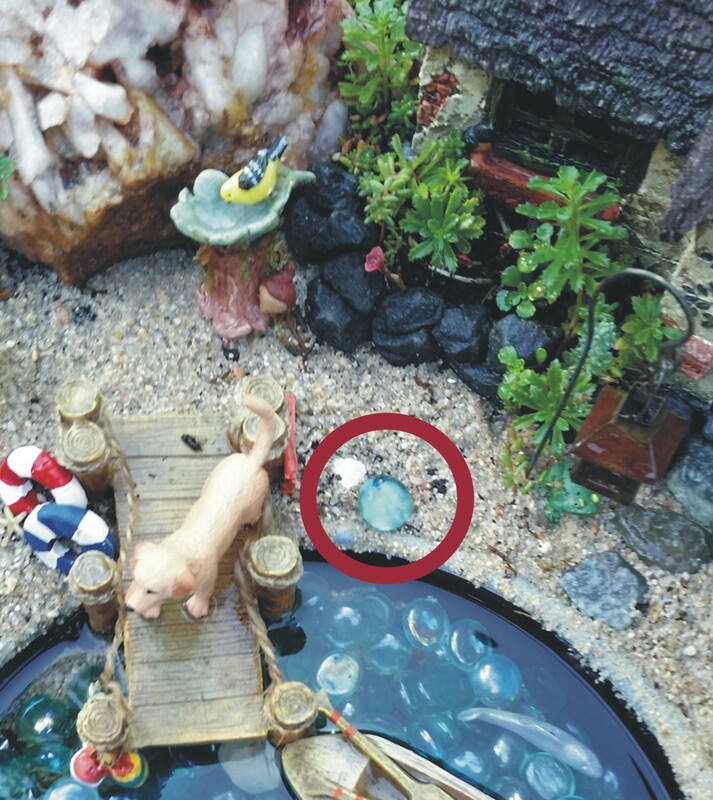 We decided to add a couple of small ponds to the picture. We added a 350 gallon pond near the back of the habitat and a 150 gallon pond by the deck. A little waterfall made a wonderfully calming sound as it bubbled and splashed away. It is so soothing! The big pond. This isn’t the best picture, but I will have more down the road for you to see. Bull Frog…Can You Find Him? What is a pond without some bull frogs? 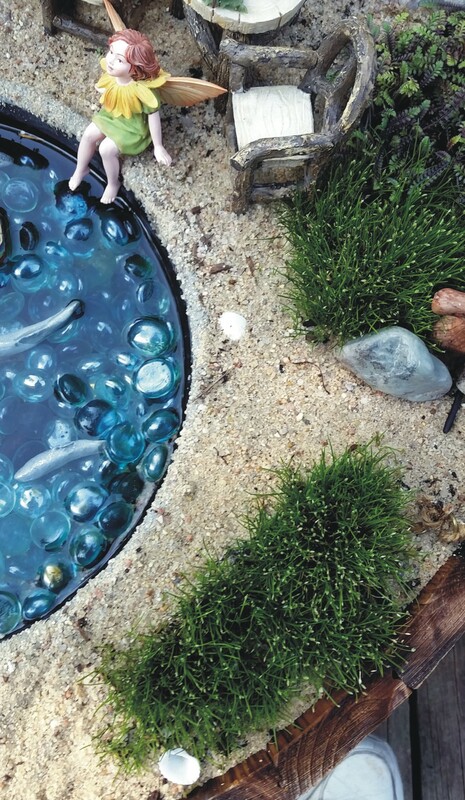 We got some tadpoles to make the ponds more interesting. I even found some “frog crossing” signs online. It took a while before we started spotting the little guys. They were so cute! Every day I looked forward to going out to the habitat and finding the frogs. They’d just sit there and blink at you in the sun. They were so cute! Actually this is a heron statue. There is a story behind it being by the big pond. One night we had someone knocking anxiously on the front door. Our next door neighbor was at the door all excited. She told us that there is a heron on our roof. Well that’s something you don’t see or hear about. My husband went outside to see if he could see him. In the meantime I heard a thud out on the deck. I peeked out my bedroom window and there was a heron standing on the wicker rocking chair on the deck. Glenn, my husband, made his way to the back door and opened it slowly. He found himself nose-to-nose with the blue heron. The heron was very tall. They just stood there looking at each other. Then the heron took off back to our roof top. I have a photo of the rooftop, but you really can’t see the heron…he was in a shadow. We giggled and went back to bed. It turned out that there was a reason the heron was in our back yard. He was looking for a night-time snack. That horrible bird ate our baby bull frogs! I was so sad….! We did some research and were told that if we put a statue of a heron out there, that no other heron would invade that territory. It worked…we haven’t seen a heron in the back yard since. We never restocked the pond with frogs either. We are hoping to some day soon. Having a wildlife habitat can be a lot of fun and very enjoyable…but these kinds of things happen. I have more stories to share later on. It is sad, but you have to realize that it is nature. The herons have to eat too. They can just go dine somewhere else from now on! The end of gardening season is rapidly approaching. I thought that I should tell you a little bit about our wildlife habitat before gardening season is over. This all started when I read about the National Wildlife Federation sponsoring backyard wildlife habitats. I sent away for the kit, since I love wildlife. For about 20 years I had been planting things, moving things, learning from mistakes, etc. I kept finding plants, flowers, and trees that I really liked, so I made a place for them. There was no real rhyme or reason to my methods. I’d put stuff wherever it fit. Sometimes it took off growing and sometimes it was an utter failure. I never gave up. As a result of all of my attempts, I wound up with a fairly natural looking, woodsy, mountain like effect. I got the kit and it said that I needed to show that I had provided water, shelter, food, and housing for the birds. That was easy. I already had all of that. Then it explained what trees, bushes, and flowers the birds liked and would be attracted to. I went down the list and found that I had a lot of that too. The last task was to draw a picture of the back yard showing what was there and where it was. I mailed it in and was excited to hear from the National Wildlife Federation shortly after that. They sent a metal sign saying that our backyard was a certified backyard habitat. They also sent a very nice certificate. We were sure excited. Now you don’t need to have a big back yard and you don’t have to have tons of plants and flowers, etc. to get certified. You could have a little balcony or patio with some pots of flowers or a potted bush, a bird feeder and a dish with water for a bird bath. It doesn’t have to be an enormous operation. I already had it all done. The birds don’t care how big or fancy it is. They will come. If you want a big back yard habitat, you can do it a little at a time and quite inexpensively if you watch for bargains. A lot of our stuff was given to us. Other stuff was in horrible shape, but we fixed it up. In future posts I will show you some of the stuff. It is fun. The most basic is a bird feeder, a bird house, and a bird bath. A simple, but adequate bird feeder…the birds don’t care how fancy it is. Our habitat has expanded to include other fascinating wild life. We have had eagles, hawks, pheasants, wild turkeys, a great blue heron, bunnies, raccoons, skunks, and squirrels. A mother duck and her babies were photographed heading for our back yard. We have also had birds stop by to get something to eat and drink that don’t even belong here. They must have been passing through on their way to other states. Yes, we have some snakes and mice, but the snakes take care of the mice and stay hidden. They are not poisonous and do a lot of good with eating bugs too. I don’t mind them so much if they stay hidden. Our back yard isn’t much bigger than most yards in housing developments. It is about 140 feet wide and about 35 feet to the house. I moved here in 1979. It was just dirt when we moved in. As I said before, I just started putting things I liked in where I liked them. It is now gorgeous. People come over and when they go to the backyard they gasp with amazement. They always say that they weren’t expecting it. They love it and want to come back. Many people have offered to help out with maintenance because they like it so much. I have a lot of photos to show you and a lot of stories to share about our habitat. Be sure to stop by to see them. And be sure to like them, pin them, share them, or comment…I would love to see what you are doing for wildlife in your back yard. Our habitat didn’t stop with birds, we have expanded to butterflies and bees too. We love wildlife! 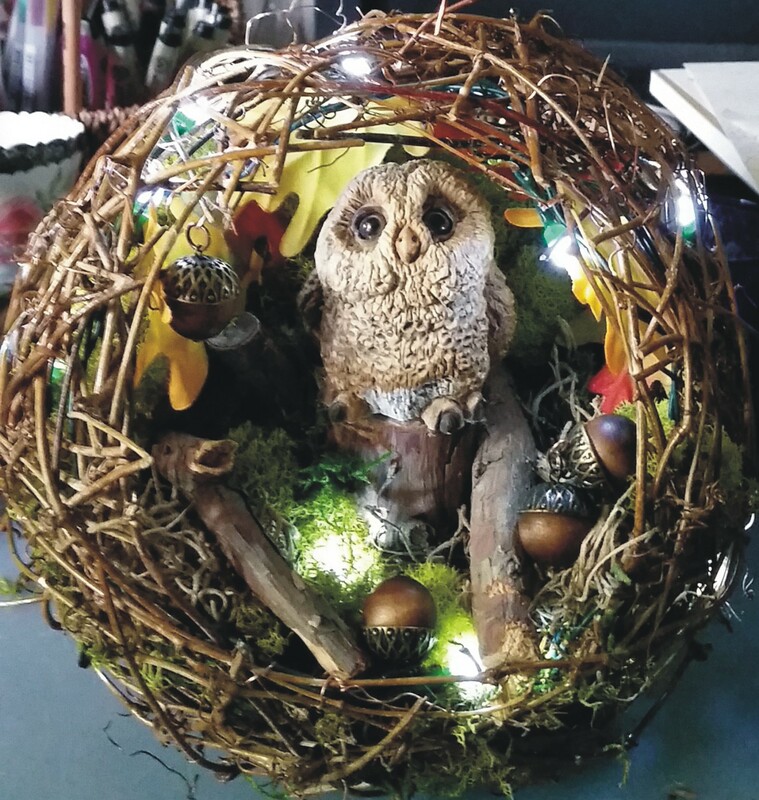 Well, mine is more of a willow owl sphere, but they are very similar. I got the idea when I became fascinated with the Willow Fairy Spheres on the Miniature Garden website. Be sure to watch the video on their site. It will really help. When I was shopping in Hobby Lobby one day, I came across the empty spheres. I got one for later on. There are many sizes, shapes and colors available online. Mine is just a brown willow sphere. Here are some pictures of some spheres. Last night I missed fairy gardening, so I got the sphere out. The video looked easy enough. Inside the spheres is a network of wire that holds the shape. I thought there were just a couple, but there are quite a few. You need to locate the wires before you start. Then you need to mark the top wire, where you are planning to put your hanger. I used a binder clip. You might not need a hangar if you set it on a table. This sphere has a flatter side to it which I used on the bottom. He might just wind up sitting on a table. Plan out where you want the opening and start cutting the wires first. You will need a wire cutters. Don’t try to use jewelry tools for this, you will ruin them with marks from this wire. Ladies, depending on how strong you are, you might need a fella to help…the wires are tough! After getting the wires snipped in the area you are opening up, take a shears or scissors and start to carefully snip an opening. Cutting into the sphere is kind of scary, but don’t fret, it will be okay. I took some of the twigs that I snipped off and remove them around some of the edge twigs to hold them in place. I put the tiniest dabs of wood glue here and there where the edge twigs were looking like they weren’t going to stay in place. The glue dries clear so no one will ever notice. Now you can start filling the sphere. These spheres are often made into garden lights by putting small LED light strings into them. The link shows white cords on the LED strings, but mine has dark green cord. I couldn’t find a link for that. I had one of those strings of lights in my supplies! 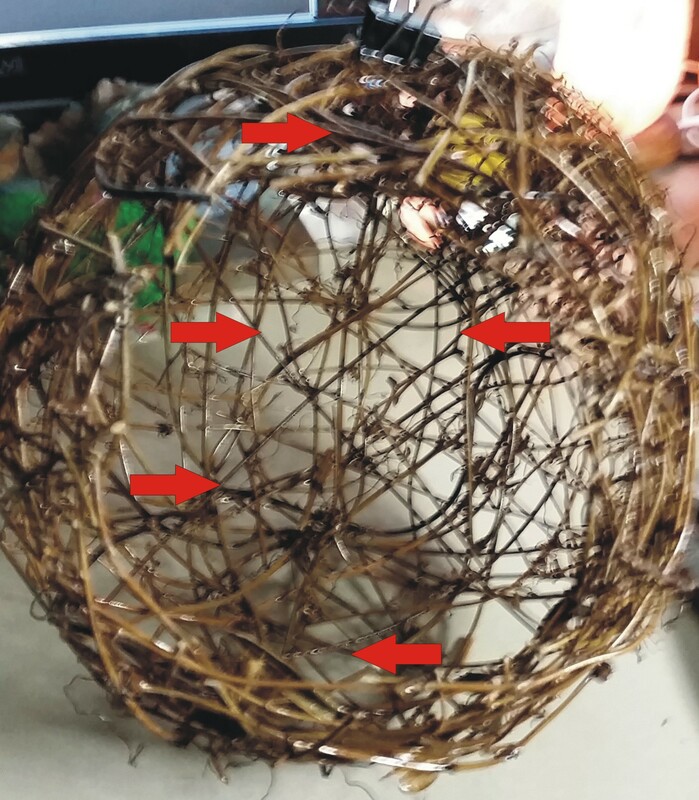 I didn’t like the way they were moving around if I just laid them into the sphere, so I took some very fine copper wire and wired the lights into place. I can antique the wire later so that you can’t see it. I wired the battery box to the side of the sphere with the switch in a handy location. I need to be able to remove the battery box to change the batteries when needed. After sticking some moss on the battery box with some UGLU tabs it became invisible to the eye. 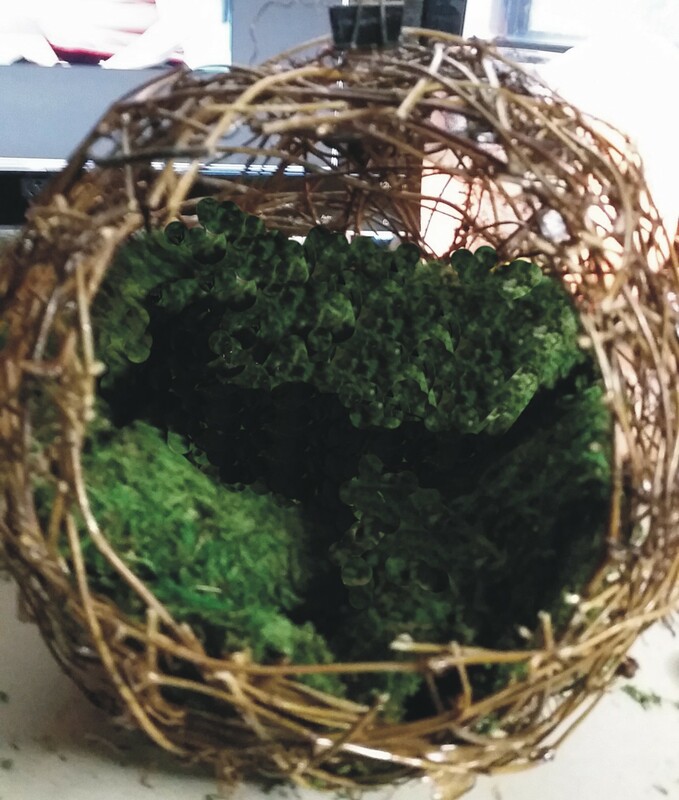 I have a wide selection of mosses to work with but first I wanted to put my main attraction into the sphere. I wanted something different. I am out of fairies right now and unable to get any more right now. I found an owl statue in my cupboard of memorabilia. He needed a special home. I found a piece of juniper branch that my husband had cut a while ago. It was perfect size for the owl to sit on. But the owl was heavy and every time I bumped the sphere or moved it the owl fell off the stump. I decided to glue him to the stump. I used a cool glue gun. I was worried that I might ruin him, but took a chance. I found out later that you can remove him from the stump if you desire. I had to readjust him and glue a stick behind him to keep him from falling back. That worked for falling back, but he kept falling forward too. I didn’t want him to take a nose-dive out of the sphere when it was hanging! 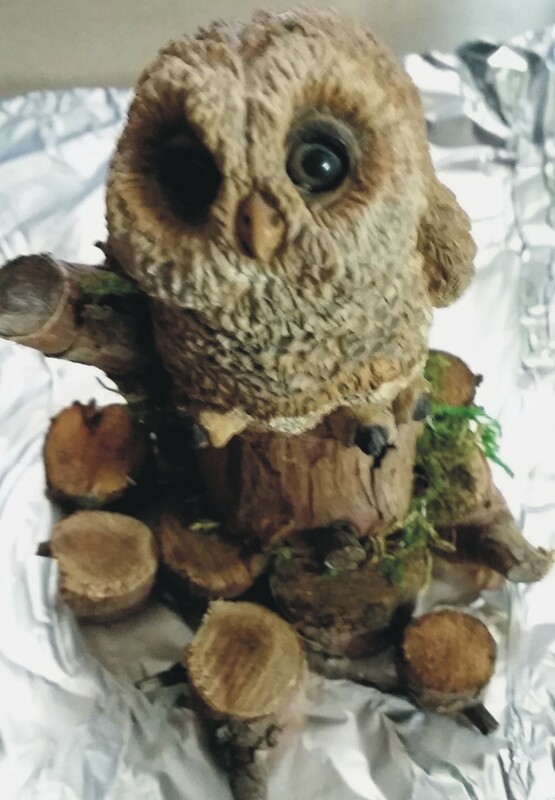 I found some little juniper branch discs in my stash and decided to make a base for the stump and owl. It took several attempts of making it large enough in all directions to keep him from falling over. Success! A lot of moss later I decided I needed some color and remembered that I had some fall silk leaves stored away. 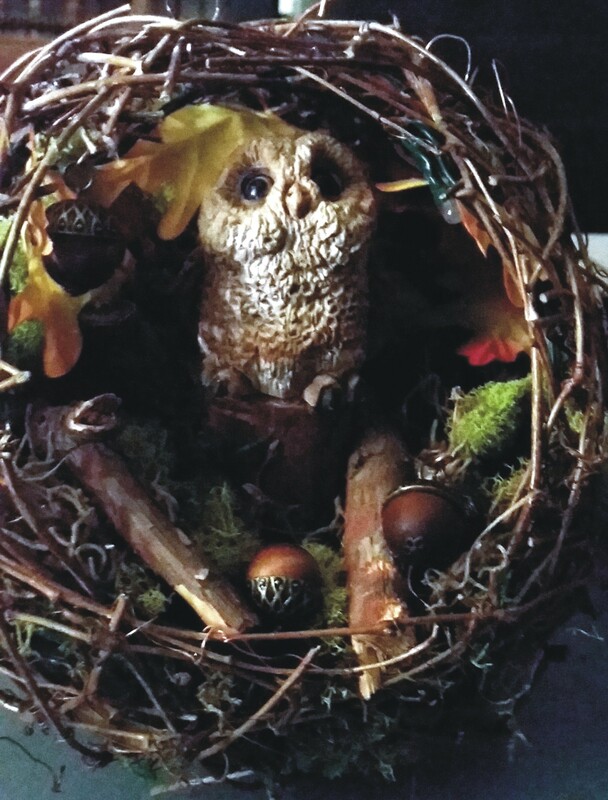 I got them out and started placing them into the sphere behind the owl. They are a little big, but in the world of fairies, it doesn’t really matter. The color is what I was looking for. I added a couple of stray sticks and some acorns that I had in my jewelry supplies. The acorns worked very well with the silk oak leaves. All I have to do now is make a better hangar on the top if I decide to hang him up. I think he came out cute! What do you think???? I am determined to use up some of these things I have around the house that need to be used or thrown away. Why not put them to good use! This project was a lot of fun. I feel good that I used stuff I already had. If you try making one let me know. I would love to see it! Hi Ho, Hi Ho, a Camping We Will Go! 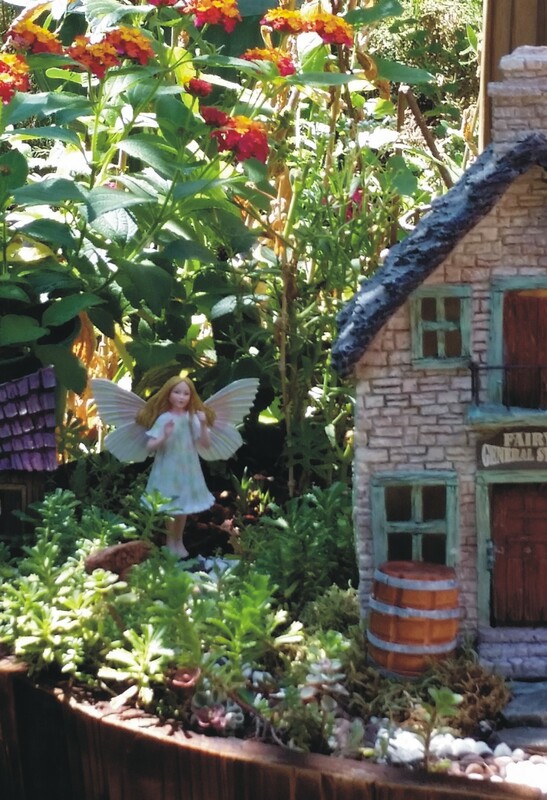 The fairies have enjoyed the lake, but are now ready to really get away and enjoy nature in a secluded setting. They have decided to fly there to save time. If you have your fairy dust, sprinkle away, and let’s go! We are going to land on the east edge of the garden. Remember that you can click on the images to enlarge them for better viewing. It is a very brief walk to the campsite. Just follow the gravel road. Be sure to watch out for wildlife. On the left you can see a red fox hiding in the plants. Now be careful! I hear a bear. Sometimes the black bear cubs get into the trash by the camp ground. We can sneak by him if he is busy digging in the trash can. There he is….sneak by quietly. I made the bear, the trash can and the garbage out of polymer clay. I love that polymer clay! You can make almost anything out of it. Go to your right when you get past him. One of our fairy friends, the Red Campion Flower Fairy, is already here waiting for us. She brought a big picnic basket full of food. The tent is up and there is a nice picnic bench and table there. The table and benches are made out of little discs of juniper branches that my husband had cut for me. Just glue several discs together with a hot glue gun and add some moss here and there. I made the picnic basket, the lantern and the camp fire pit out of polymer clay and stones. The camp fire pit is full of wood and ready to light. A hummingbird feeder is there and there is a hummingbird enjoying some juice. After we have something to eat, we will go exploring. Try not to make too much noise. Next to the tent is a sleeping enchanted tree with a big owl nest in its branches. I made the tree using polymer clay and a big dose of imagination. I would be happy to post instructions for the trees in a later post. 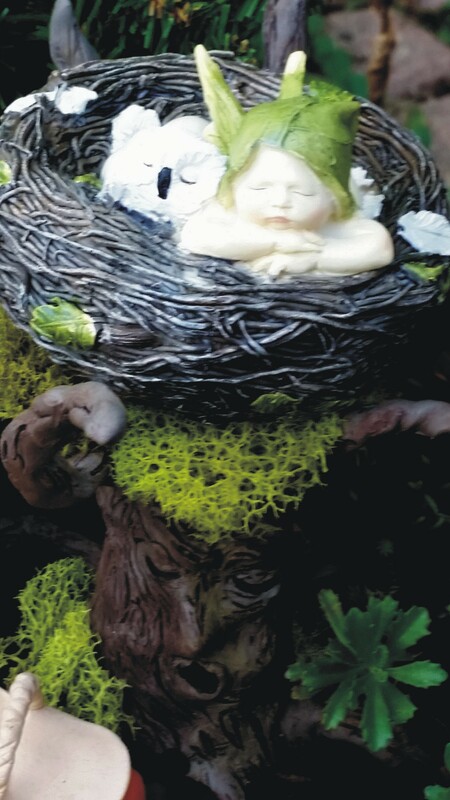 There is an owl baby and a fairy baby taking a peaceful nap. How cute is that!!!! Lets go exploring. There is a waterfall near by. I see a doe and her fawns by the waterfall. There are all kinds of flowers and plants to look at. Some of the plants have already bloomed and others are getting ready to. I really like the blue bell flowers and I love the miniature trumpet vine next to the waterfall. The flowering plants all came from the local nursery. They had a big sale one day and I went crazy. The ground cover is from the lumber yard garden center. Now if we go to the left, you will find another enchanted tree. This tree has a swing to have fun on. The tree is friendly but is quite old, so be gentle with him. Don’t eat the mushrooms that you see around the campgrounds. They might be poisonous. They are pretty to look at though. I hear some rustling in the woods. It appears there is a momma wolf and her cub watching us play. Just let her be and please don’t give the or any of the wildlife any food. The wolf and her baby, as well as the doe, the fawns, and the fox all came from Hobby Lobby in the department for model railroad scenery. Soon we can return to the camp site and have some dinner by the campfire and some restful sleep in the tent. The moonlight will make the waterfall appear to be lighted. It is well worth seeing. I will post a photo of the waterfall at night if I can get a good one. I will post it in another post update. There you have it! 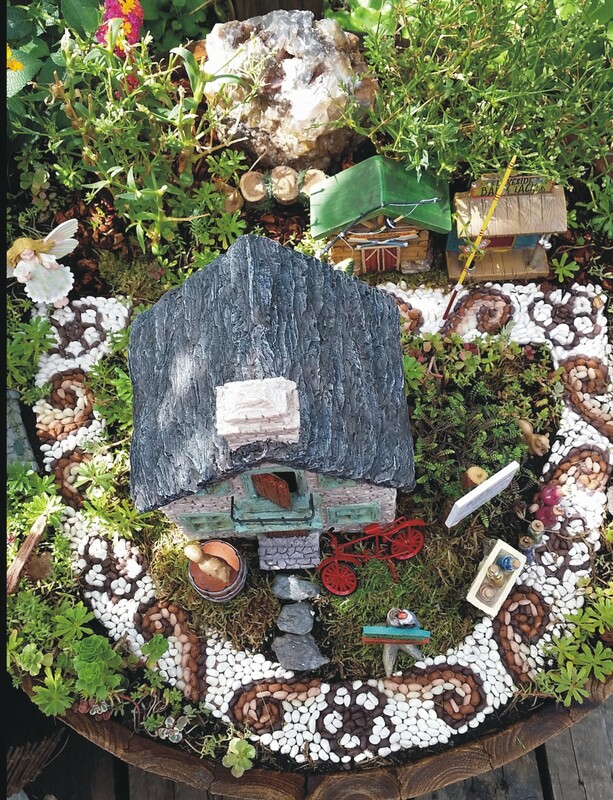 I have shown you all four of my miniature fairy gardens. I hope you enjoyed the journey. 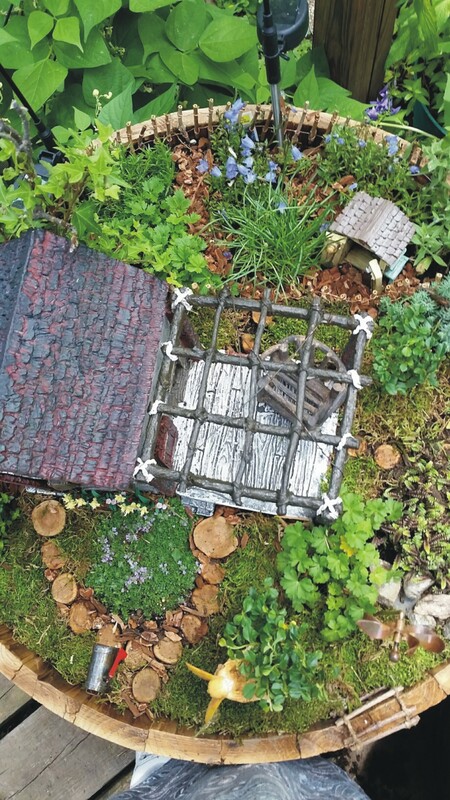 I get so much enjoyment sitting on the deck looking at the fairy gardens. I enjoy gardening in them too. They need to have maintenance done daily. It’s light gardening and very enjoyable. 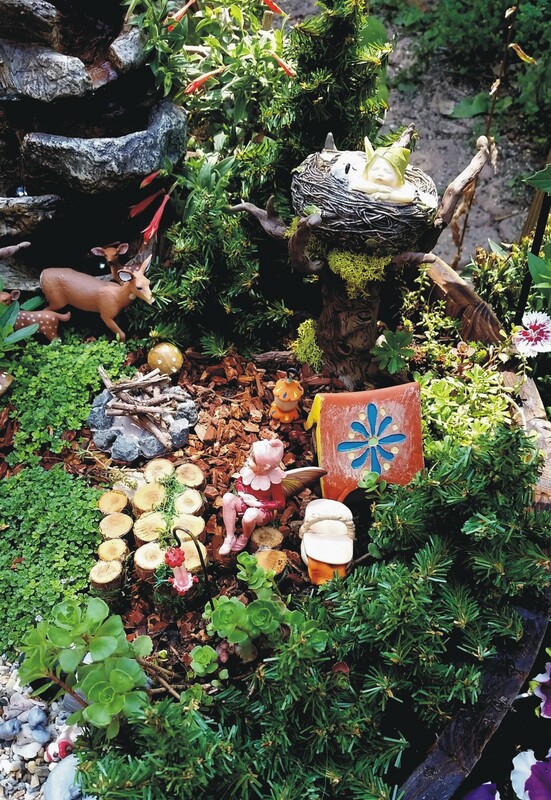 Fairy gardening is very relaxing, eases stress and anxiety, boosts the imagination, and is a great way to sink yourself into another world for a quick get away. I highly recommend it for everyone. I don’t know if any more will develop, but I will keep you posted. I have some whimsical ideas floating around in my head. There is only about a month left, if that, of gardening weather here. I will have to take all of the gardens apart and everything but the plants inside for the winter. I am hoping the plants make it through the winter weather. Maybe I should work on indoor fairy gardens for the winter months. Let me know if you have any questions. Something is Out of Place! Here is an example of what I find in the morning when my little masked bandits visit during the night. See anything out of place? They are fascinated with the glass gems in the water. Somebody pulled one out of the lake! Naughty raccoons!!!!! .The fairies have a cottage at the lake. The fairies love to go there to relax and play. The lake is for everyone and humans are welcome. You merely have to cross the bridge from barrel two to get there. It is a rickety bridge ( I know this because I made it), so unless you have dusted yourself with the fairy dust in barrel two, be careful not to fall! It is a long way down! At the end of the bridge there is a sign welcoming everyone to the lake. A sandy beach surrounds the lake. The lake was a big decision issue. I had a nice irregular shaped lake but it took up way too much of the barrel. I decided this little lake could be used more efficiently. 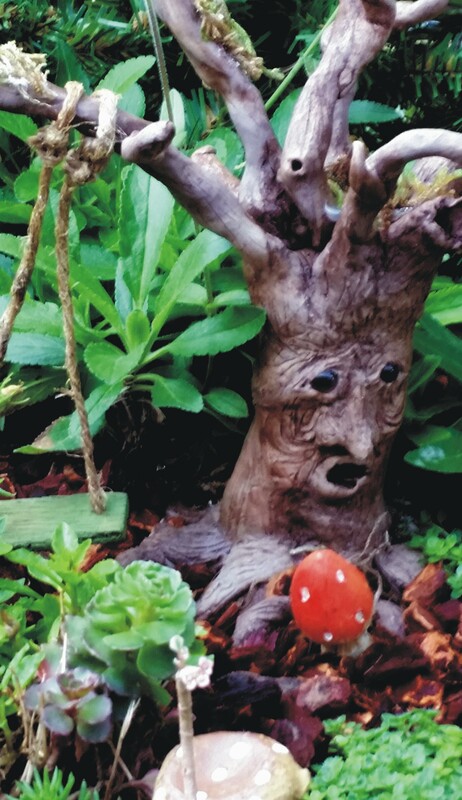 Imagination is all part of the fairy gardening. Imagine that the lake is big. I glued some sand around the edge of the dish that I used for the lake to make it look less like a dish. The sand is just play sand and came from the lumber yard. The blue glass gems give the impression of water. The link to these gems is not exactly what I got, but the store has them in the floral department for about the same price. It reminds me of the water color in the Caribbean. There is a dock for swimming or going fishing. A boat is there waiting to take you fishing or for a nice boat ride. This boat is manually operated…sorry, no motor! It is great arm strength building to row the boat. Here you see a fairy dangling her toes in the water. She had better be careful because there are some big fish in the lake as you might be able to see. They might be attracted to toes and mistake them for something to eat! My father always warned me about wearing nail polish on my toes and dangling them in the lake. He said muskie and northern pike are attracted to that and might take a bite here and there. They both have large, sharp teeth. That would hurt! I made the fish out of polymer clay. I used silver clay and added some silver glitter to the clay to give it a really shiny effect. It worked! The lake is a relaxing place where you can sip tea or lemonade, swim, fish, and play in the sand. 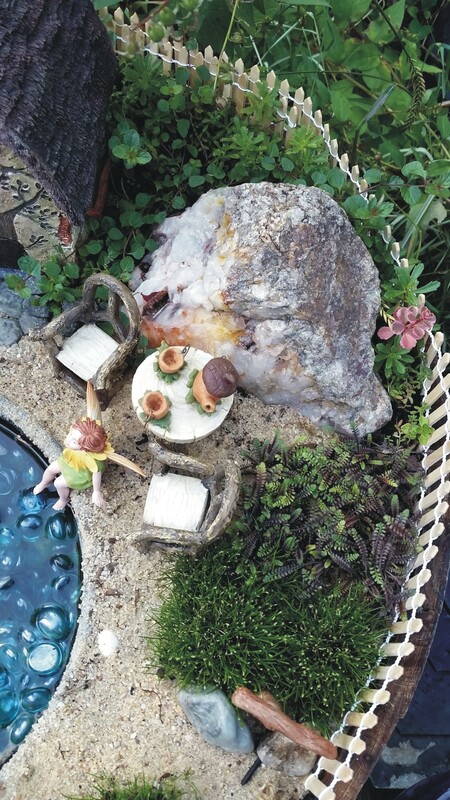 The chairs and table were part of a fairy garden kit. A dog is having fun standing on the dock and barking at the sea-gull sitting on the post and the giant snail. Sometimes the fairies ride the snails for something fun to do. The snails don’t mind at all. I made the seagull, the snail, the leaf bird bath, and the tea set and the sand castles out of polymer clay. A picket fence surrounds the back of the cottage. There are two big rocks on either side of the cottage, again, from the Amethyst mine that we went to. This amethyst mine is not how you would imagine it to be. When I hear the word mine, I picture a cave. This was a large, deep pit that was out in the open in the forest. You had to hike in to get to it. It was great. I have a hard time going into caves due to claustrophobia. I was pleased to see the big, deep hole in the ground. We just walked down the ramp that had been built for the big heavy equipment to drive down. Using special rocks in your gardens is encouraged. It makes the garden special. I used a mix of ground cover for the plants behind the cottage and some Leptinella and Miniature Rush on the beach. I was a bit worried about the Rush as it needs to be kept quite moist, but the sand seems to be doing the trick. Both are spreading nicely. The ground cover link was as close to what I bought as I could get online. I bought the plants in person and it was a mixed tray for about $16. It was a sheet that you could cut into any shape you wanted which made it easier for in the fairy garden. 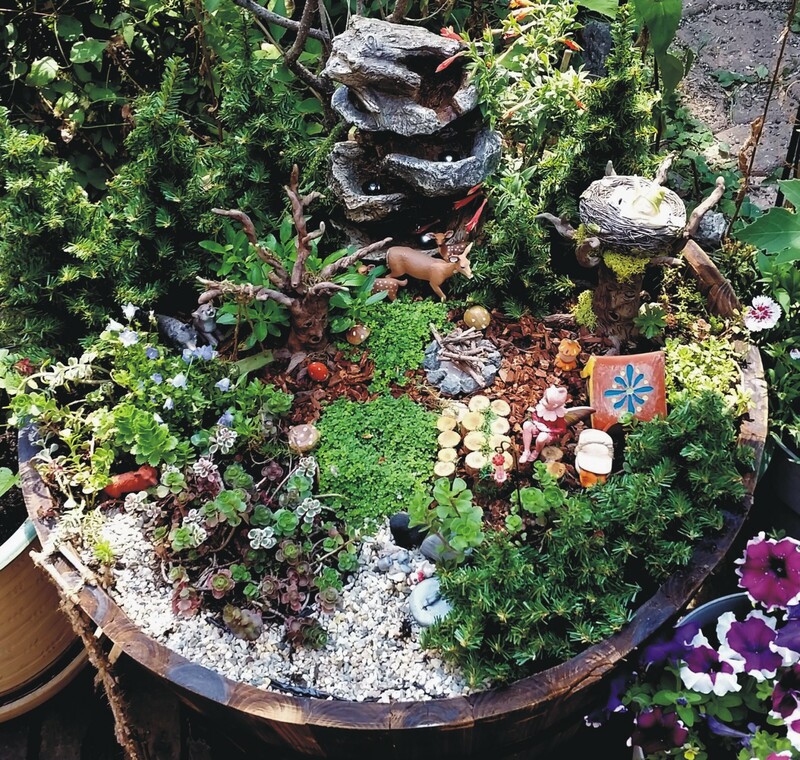 I was able to do all the fairy gardens with the one tray. It spreads! On the far right of the barrel, you will find another stick ladder and a sign, which I made, pointing to a camp ground. The camp is a ways away. Humans and fairies alike will have to either climb down the ladder and walk to the campground, or will have to fly. Hope you humans brought some fairy dust! It’s a long walk! Enjoy your time at the lake and look forward to your trip to the camp grounds! Will see you there! As a reminder, if you click on the images they will enlarge so that you can see the details. I’m so glad that you came back! It’s time for a trip to barrel number two. Let me take you on a tour. If you have any questions along the way, let me know. The pictures will enlarge if you click on them so that you can see the details more clearly. 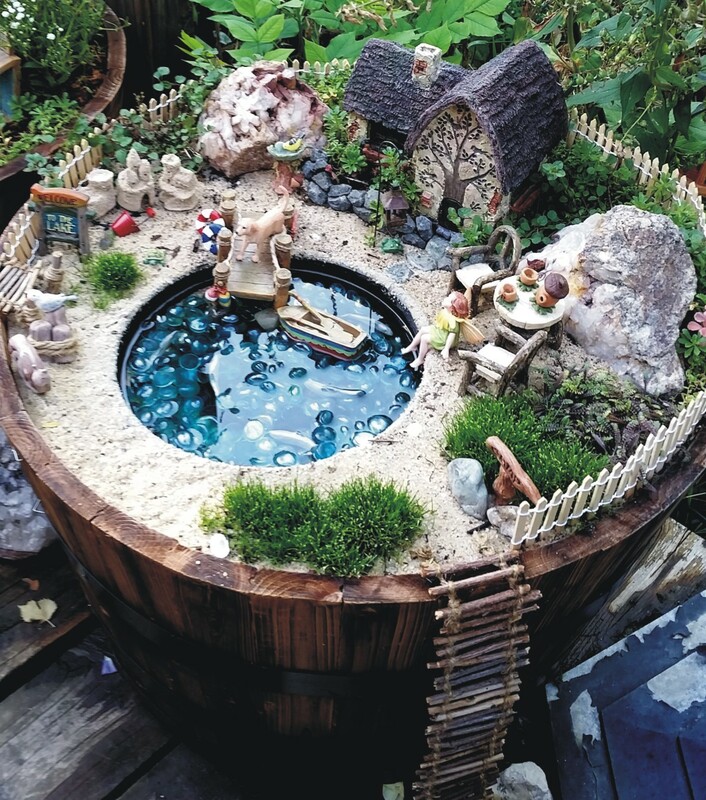 This fairy garden reminds me of a small resort town where I grew up every summer in Wisconsin. I remember a general store and a lot of trails, boat rentals, bait and tackle shops, etc. It brings back fond memories. Look at the Baby’s Breath go! It was a good thing to give it a major haircut! Barrels one and two are connected by a covered bridge. That was one of my husband’s ideas. He is really helping a bunch with these gardens. I think he secretly thinks they are pretty neat. I went online and viola! Found a covered bridge. It fits perfectly over the two barrel edges. Now the fairies can walk to town. In town there is a general store. I had to put a pickle barrel outside the store. I remember one being at the store in my resort town. Behind the general store is a nature trail to enjoy. I had two Baby’s Breath plants that I couldn’t seem to find a place for in my big gardens so I planted them in the barrel. I kept having second thoughts because they were quite big. I finally just took a shears and trimmed them way down. Today I noticed that they are starting to flower. They are perfect! I am glad I left them there. This fairy just went for a walk on the trail behind her. There is a sign right in front of her that points to the trail. A bait and tackle shop and a boat rental are also behind the store near the next barrel. You will see why I needed those. My husband added the fishing poles. One has a big fish on it! I think that is wishful thinking on his part! I also made a peace pole for the garden. I just learned about peace poles. I think they are fabulous…but they are very expensive if you buy them already made. My next big project is making a real peace pole for my big garden. I have the pole and the paint. I am anxious to get started. I will cover that in a later post. In front of the store is a sign with arrows, as you can see in the picture above. One arrow says nature trails, one says lake, and one says campground. Oh no! I need more barrels! Golly!!!!! My husband, Glenn, groaned and shook his head. The way I see it is that if there is a sign pointing somewhere saying there is something there, it needs to really be there…right?????? I have provided the nature trail in this barrel. So far…so good…I’m doing great. Next to the store is a white sign that is for human visitors to read. I get silly sometimes, but thought it would be cute. I went online and researched fairy lore and found that elderberry wine helps humans to see fairies when the humans drink it. That is fun! I also found that if humans sprinkle fairy dust on themselves, it will enable them to fly like the fairies. I don’t know if this is all true folklore, but thought I’d believe it. I made the sign and then found some tiny bottles in my jewelry supplies. I filled some with different colored glitters to represent fairy dust. I found some bottles that looked kind of like wine bottles and filled them with resin colored with a wine-colored paint. It worked! I glued the corks on each bottle…humans can still open them, but hopefully the raccoons and squirrels can’t. Now for the prize addition to the garden…I made the mosaic road that surrounds the general store and takes you through the town. It was a labor of love. Since mine is outside, I had to make some changes. I would be happy to share those changes if you would like…just ask. I think it is fabulous. What fun! It took several days of tedious work, but I was so excited to see it actually in the garden with plants all around it. It worked! The rock in the picture below is a special one. It came from an Amethyst mine in Colorado. Glenn and I go rockhounding and had been invited to the mine for a dig. It was awesome! There isn’t much value in this rock, but it is fun to have and look at. So there you have it…the tour of my second barrel. Hope you enjoyed the tour! What do you suppose will be next???? Be sure to check back and see. 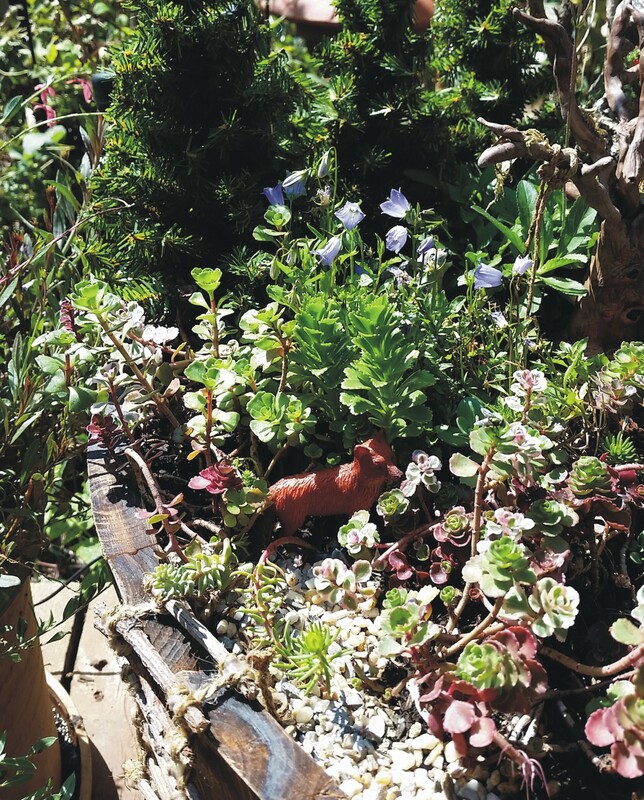 Right now I am working on Miniature Fairy Gardening. 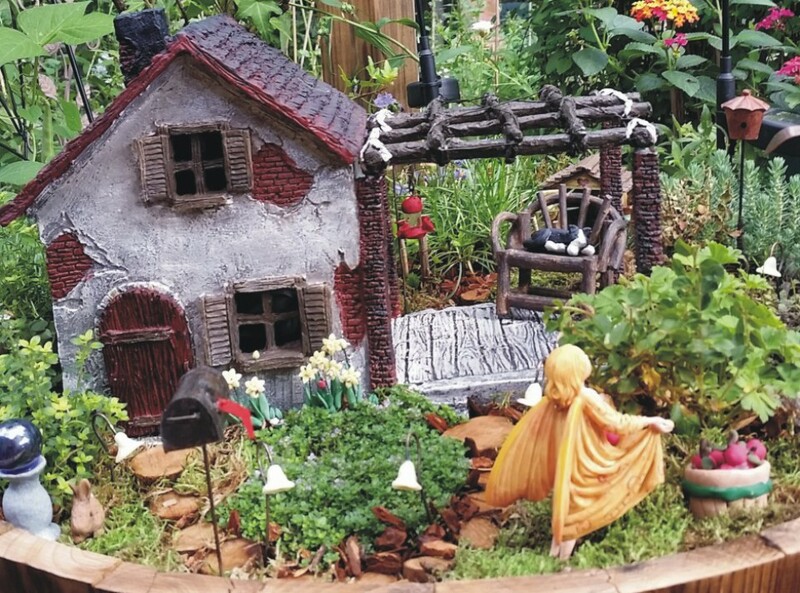 Miniature Fairy Gardening is merely taking a container, adding miniature houses, accessories, plants and fairies, and letting your imagination run wild. I tried to resist the temptation for a long time. As long as I can remember, I wanted a big, fancy doll house. My mother always said that those were for big girls and were very expensive. She was right on both counts, but now I am a big girl and I need to satisfy the desire. I started doing two tiny gardens, one in a basket and one in a dish. I was hooked immediately. I had to do more! It needed to be bigger and more grand! 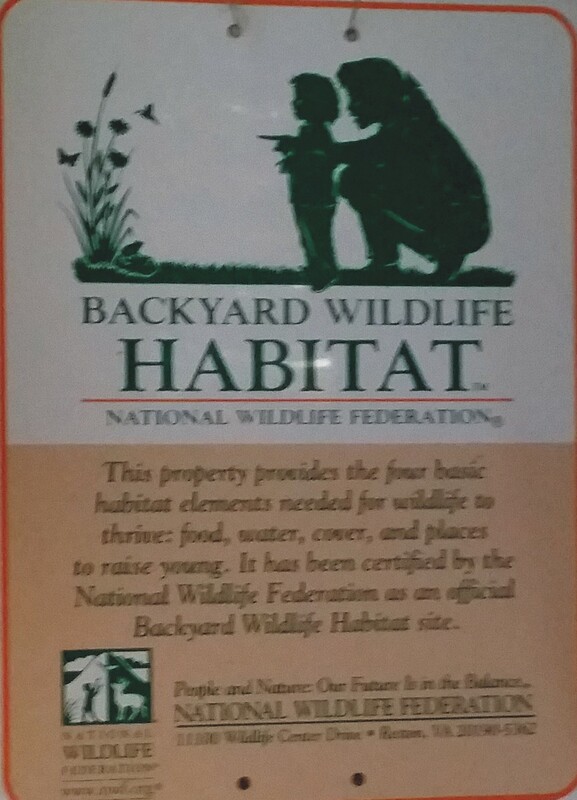 I have a big back yard that is a wildlife habitat, certified with the National Wildlife Federation. I’ll explain that whim later. I love gardening and wildlife. I thought a half barrel on my deck would be a great fairy garden. My husband got the barrel and I began to fill it. The more I did the more I wanted to do. 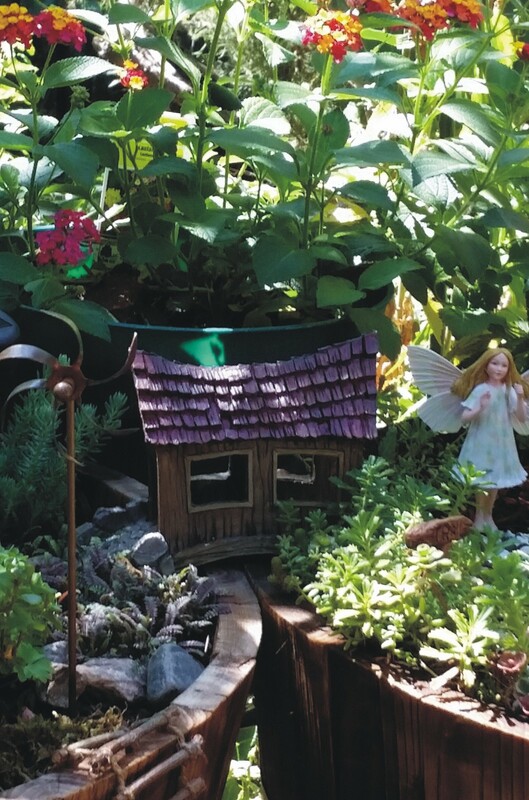 I bought a fairy house online and a fairy and got some plants at the local nursery. I wanted accessories, but those can get quite expensive. I decided to make some accessories using my polymer clay stash in my craft supplies. Some of them are crude, but still get the idea across. I also found some small, round cuts of wood, some moss, and some small bark. It is amazing what you can find in the house and garage. I made a stick fence for around the flower garden in the back and some mini garden lights out of Sculpey glow-in-the-dark polymer clay (so far they aren’t glowing!). I did order a mini garden shed. I would be happy to post the names of the plants that I bought…just ask. Last, but not least, at my husband’s suggestion, I made a stick ladder that gives the fairies a way to escape. It was a cute idea! I was, and still am, concerned about the wildlife antics at night. We have had a family of raccoons visiting our back yard every night for over 35 years. Normally they behave themselves. 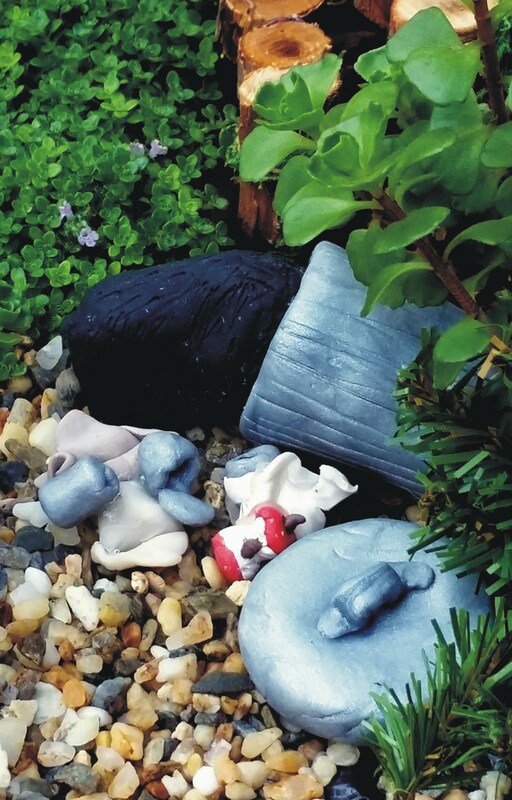 They like to turn over my husband’s gnome statues in the garden. They also like to play with our glass gazing ball. I have yet to figure out how they keep from breaking it! So far, so good. They have dipped their little fingers into the gardens already. Every morning I go out and check for damage. Nothing more than an accessory being moved from one side of the barrel to another. Most everything in the garden either has a pick anchoring it down or is taped using some special indoor/outdoor sticky stuff. I hope my luck continues. Other wildlife have accepted my mini gardens too. I have had lady bugs, butterflies, small bees, and lace wings visiting the plants and flowers. It is so cute to watch! I added a picture of the garden in two views. It changes from day-to-day if I add things or take things away, but it is so pretty and totally enchanting…I feel like I am living there. 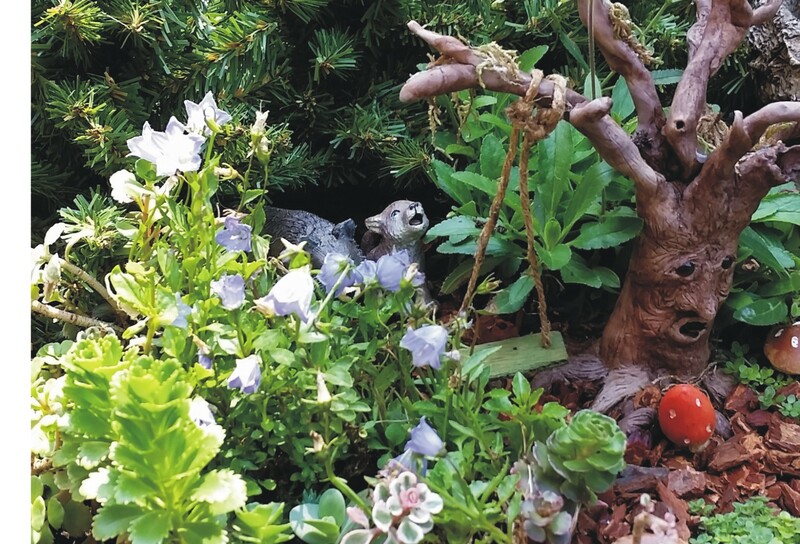 The garden’s backyard is full of flowering plants and of course, critters. I had to make another one! I will tell you about that in my next post. The Naja Tool and Supply This is a fabulous store. They carry almost anything you can think of needing for making jewelry. I have never met friendlier people. There is a jewelry making school next door that teaches everything you would ever want to learn about jewelry.